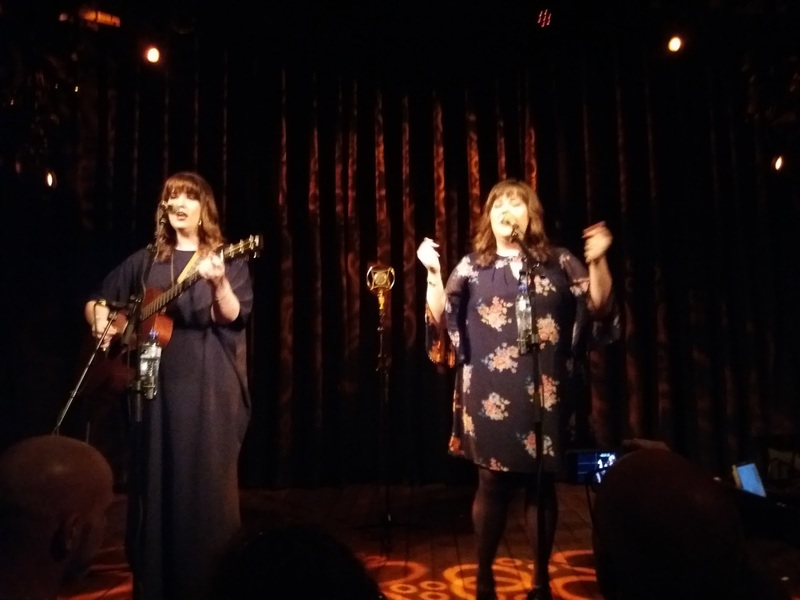 The upper hall of Paradiso filled ever better for The Secret Sisters and the enthusiasm of both the duo and the audience rose ever higher. In the end it must have been like a warm bath enveloping us all. Although, I would think, everybody came for the music, we got loads of stories and some stand up comedy for free. My guess is that The Secret Sisters could play twice as many songs if the "Paul Simon" of the two, the one NOT playing the guitar, had sung a bit more and talked a bit less. At the same time, the stories and the way they are told, add to the joy of being present at a The Secret Sisters show. Two ladies of a certain notable softness walked onto the stage. Sister Laura instantly started talking. 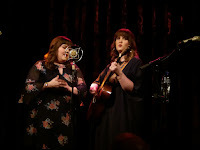 Sister Lydia stood listening, smiling, acting surprise and providing some deadpan comments where appropriate, before the duo entered into the first song of its latest album. 'Tennessee River Runs Low' is one of the sad and depressing songs that the audience was warned it was going to hear. "Sad songs make me happy", a lady close to me replied. And they can and do. To some because they are beautiful, to others, of a more cynical inclination, because the sadness is onto others and not onto themselves. With 'Tennessee River Runs Low' the standard of the evening was set. This song is of an extreme beauty. With just Lydia's guitar, strummed in a delicate yet relatively simple way and the two sisters' voices the room was filled to the brim. Within seconds I'd lost all notions of the missing band that's on the album. With voices like this there is no need for anything else, as the final a cappela sung song proved. Next up was a murder ballad. 'Mississippi' is such a fine, great, fantastic song. Every band may wish to have a song like that. One that stands out on an album like this song does. (For Dutch readers, no, this is not a cover of Pussycat's number 1 hit song from 1975.) Live it totally enveloped me, cherished me and held me. For three minutes something I was in musical heaven. And no, this was not the end of the show, for me that is. Many fine songs were played, including a few beautifully played covers and stories of meeting the artists. Graham Nash, Paul Simon, Don Everly. Through all the teasing in between I feared that a murder ballad was about to act itself out on stage, but Lydia stoically undergoes all the bantering of Laura and has her own little moments. 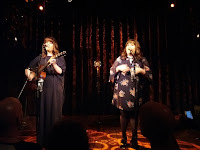 Another highlight came with 'Bad Habit' another fine song, with those extra fantastic harmonies. The title song of the album 'You Don't Own Me Anymore' was written not for the record company but the person 'Bad Habit' and 'He's Fine' seemed to be written for. A lifetime of inspiration to turn back to is my guess, as the present happy relationship is not working out inspirationally where new songs are concerned. 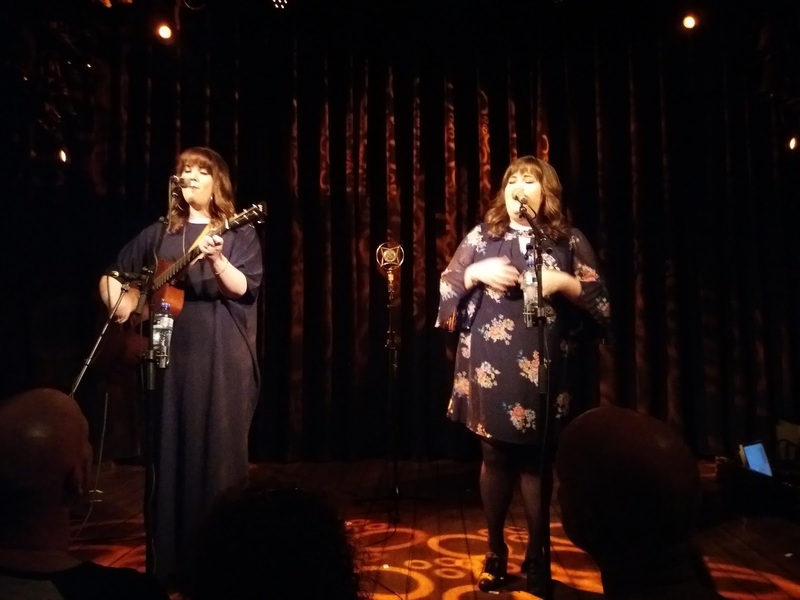 The Secret Sisters live is a joyride of different proportions rolled into one. I had a really fine evening at the Paradiso. And, yes, please do not make it that long again, if only because my girlfriend really wants to come also next time.